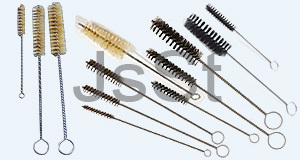 Product Specification:- In twisted-in-wire brushes, the filament material is twisted between two wires. This type of brush is primarily used to clean the internal walls of pipes. Like all other Jay Shree Shaktima Textile brushes there is a wide range of possible filament types. The middle of the brush consists of what is called the ‘soul’, which is usually made of two twisted wires. The thickness of the twisted wires can vary. It determines the strength as well as the fill density of the brush. Wire Brush by Jay Shaktima Textile at Pakbiz.com a premier Business to Business marketplace and largest online business directory. Find Wire Brush from India complete basis & contact information, business offers, availability & related Textile Products products. This page gives you information about the authentic sellers of this product. It allows buyers and sellers communication directly. It can also facilitate the buyers to purchase the product in reasonable prices.